A-HOTEL.com - Luxury and cheap accommodation in Khrushchevo, Russia. Prices and hotel, apartment booking in Khrushchevo and surrounding. Situated within 6 km of Tula Kremlin and 6 km of Tula State Drama Theatre, konditierghrad provides rooms in Tula. The property is set 6 km from Tula Samovar Museum. Situated in Tula, 3.7 km from Tula Kremlin, Apartment on Kurkova provides a living room with a flat-screen TV. Hotel Morgan is located in Tula, within 2.7 km of Tula Kremlin and 2. Set in Tula, 2.8 km from Tula Kremlin and 2. Like Hostel Tula is situated in Tula. Located around 2. Offering city views, Apartment on Soyfera 33 is an accommodation situated in Tula, 2.5 km from Tula Kremlin and 2. Beryozka Hotel is located in Tula, within a 10-minute walk of the central park. Free private parking is available. 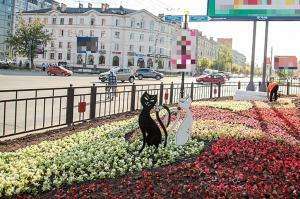 Apartamenty na Veresaeva is located in Tula, 2.6 km from Tula Kremlin, 2. Inndays on Dm. Ulaynova (эконом) offers accommodation in Tula, 2. Boasting city views, Фрунзе.6 features accommodation with a balcony, around 2. Set 2.5 km from Tula Kremlin in Tula, Апартаменты студия на Фрунзе offers accommodation with a kitchen. Offering city views, Apartment on Krasnoarmeysky Prospekt is an accommodation located in Tula, 1.9 km from Tula Kremlin and 1. Like Hostel is located in the centre of Tula in the middle of Krasnoarmeysky Prospekt. Free WiFi access is available. Inndays on Lunacharskogo-3 is set in Tula. This property is 2. Situated 2.8 km from Tula Kremlin and 2. Located 300 metres from the Tula Central Park and 2 km from the Tula Kremlin, Sayany Hotel features free Wi-Fi. Guests are also offered a sauna. Set in Tula, 2.7 km from Tula Kremlin and 2. Apartment MaliNA enjoys a location in Tula, just 2 km from Tula Kremlin and 1.5 km from Tula State Drama Theatre. Set 1.8 km from Tula Kremlin in Tula, Apartment on Krasnoarmeyskiy prospekt 15 offers accommodation with a kitchen.